John Day (1522-1584) the most skilled and innovative printer of his day was recognised for his exceptionally high quality work. He specialised in printing and distributing Protestant literature and small-format religious books and is best known for publishing Foxe’s Book of Martyrs. 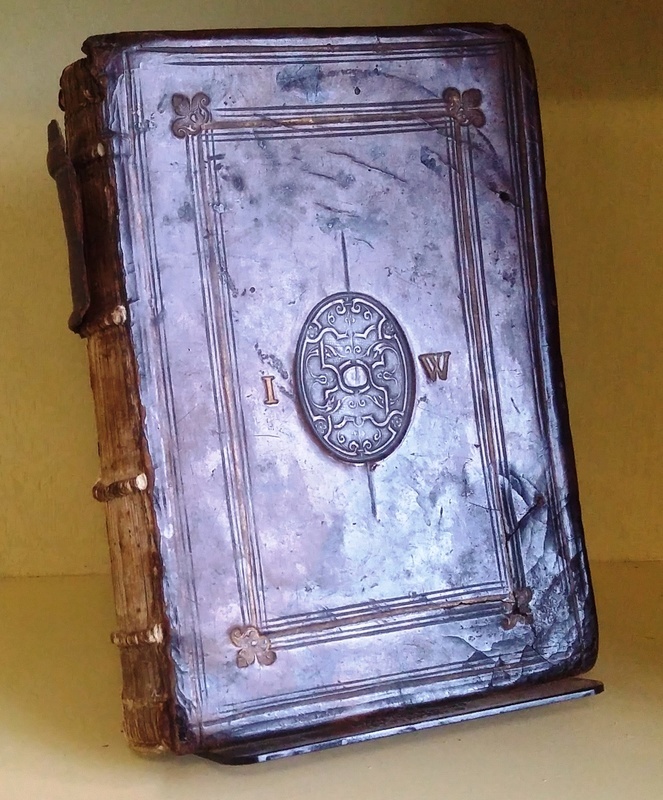 In 1569 he produced, reputedly exclusively for Queen Elizabeth, Christian Prayers and Meditations. Only one complete copy is known to be extant. 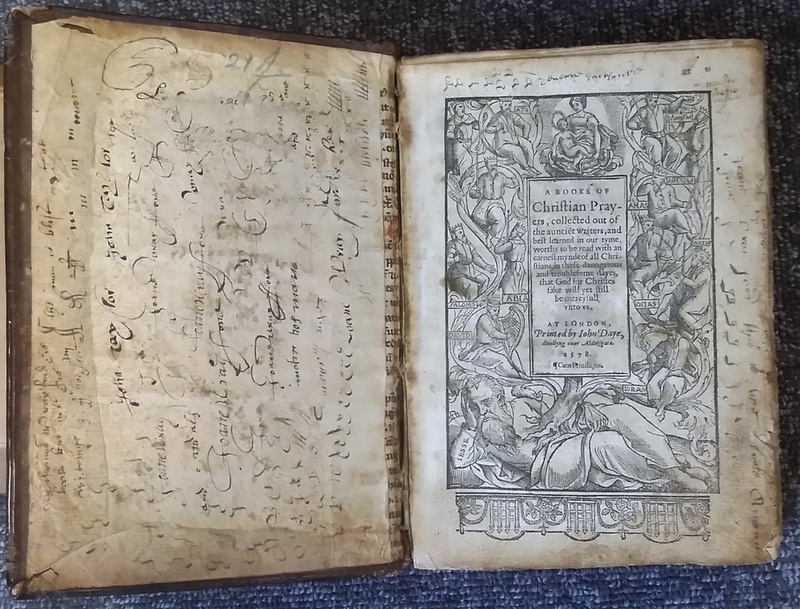 This prayer book (both the 1569 and the 1578 version) is notable for a number of reasons one being the depiction of the protestant Queen Elizabeth at the front of the book. 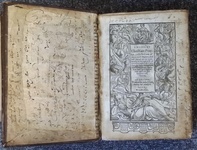 But, perhaps the outstanding reason for the book’s continued prominence is the plethora of fine ornamental printing; the splendid full-page woodcut of Elizabeth kneeling before a prie-dieu to the verso of the title page, the title itself surrounded by a broad woodcut border showing the Tree of Jesse and each page of prayers elaborately decorated with woodcut borders in historiated ornamental blocks. 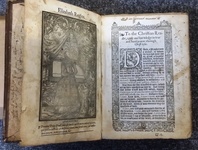 Although John Day and his son, Richard, had an uneasy relationship, Richard did work with his father for a time: our featured book, typically referred to as “A Booke of Christian Prayers” or more popularly as “Queen Elizabeth’s Prayer Book” is an adaptation of Christian Prayers and Meditations with a preface by Richard Day(e). 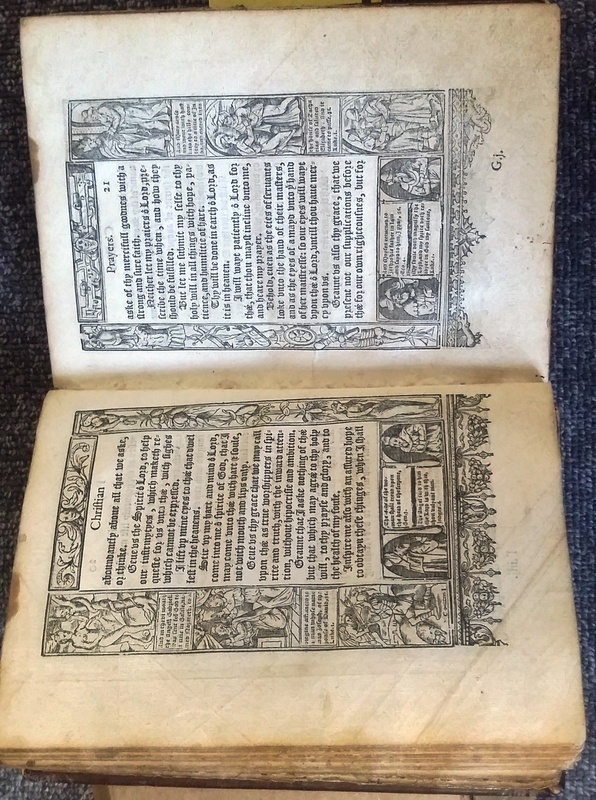 The two works are similar both being a collection of private devotions appropriate for day-to-day usage, however, this 1578 edition is regarded as a separate work as much of the material was rearranged, omitted or added to. The visual narrative in the historiated borders again was similar to the 1569 work but much extended. Many of the ornate woodcuts are supposed to be based upon works by Albrecht Dürer and Hans Holbein. They illustrated the life of Christ, virtue , sin, the five senses and, finally, the Dance of Death. 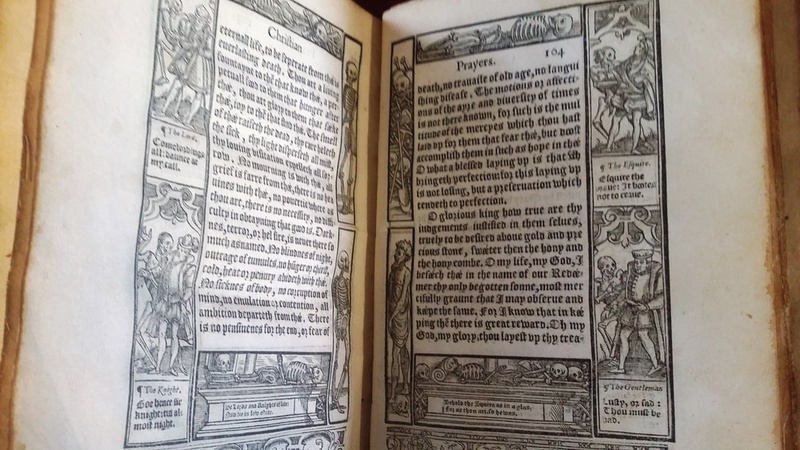 Our copy is a more scarce variant of the 1578 edition as its preface “To the Christian Reader” is signed Richard Daye, and not R. D. (see ESTC). And what of Joane Wrayford? 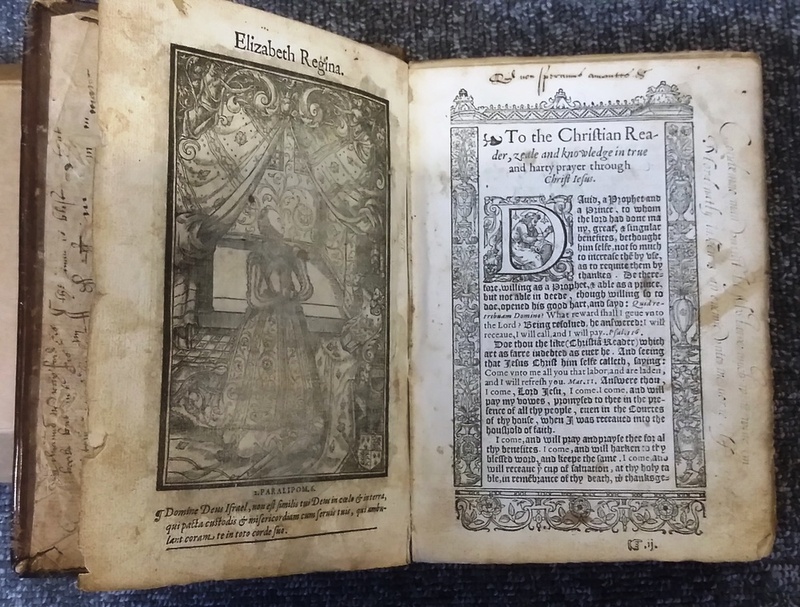 This lovely book is undoubtedly important, both as regards the history of English printing and the story of Protestantism during the reign of Elizabeth I. But it is of consequence too, because it once belonged to Joane Wrayford. I don’t know who she was but a quick internet search reveals the family name, the Devon villages of Moretonhampstead, Silverton and Bovey Tracey where Wrayfords lived. Some of their wills are now on-line. The name can be spelt Wrayford or Wreyford or Rayford. Was she Joanne, Joan or Johne? Some day, I’d like to know. What I love most about this book is to know that some 400 years ago or more “Joane Wray Ford”, as she spells her name, was given, or had bound in leather, this very book. Her initials have been stamped on the upper board, (the leather has the beautiful shiny patina of centuries of use). Just inside on the endpaper, or paste-down, one sees that Joane has practised writing her name. She practised writing individual letters - she may have been unsure of her writing skills. Later in 1623 Silvanus Wrayford (who, elsewhere I see, supported Charles I) does the same in the back of the book. Elsewhere devotional sentences have been written in the margins of the text. But it is the names that stand-out. As if to say "This is my book!, I own this book!". Was Joane, Silvanus’ grandmother, mother or aunt? Did she give the book to him or did he inherit it? And who is John Taylor? He too appears on the endpaper amongst the Wrayfords. But of course, I don’t really know. Perhaps the book didn’t belong to ‘Joane’ perhaps it was a man’s? John Wrayford’s, maybe? However, I like to think it was a ‘she’ and her name was Joane. I like to think of her, in her coif, perhaps at a scubbed deal table sitting and painstakingly writing her name in the front of her book, and then turning the leaves to those astonishing and fantastic pictures. Praying to ensure her righteous place in Heaven.